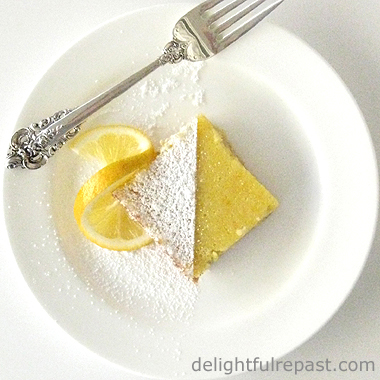 Needed to make a special treat for myself as this week is my ... drum roll, please ... Fifth Blogiversary. Can't believe I've been at this so long! Five years of weekly posts. Of my English comfort food, Southern comfort food, comfort food of all sorts, sweet and savory. Afternoon tea is my favorite bit of comfort, so these whatever-you-call-ems are going to be appearing at lots of future tea parties. But they're good anytime and go with coffee as well as tea. They're sort of like mini pies, and "pie and coffee" is a classic combination. 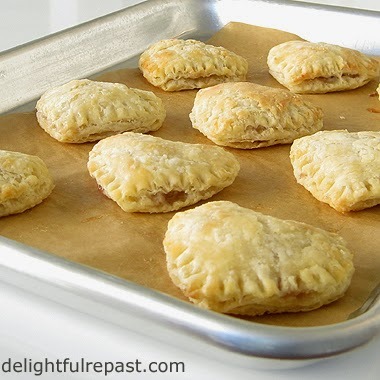 Please don't make these with store-bought refrigerated pie crust; they won't turn out so puffy and flaky as these, and they won't have the right flavor. Be sure not to overfill them and to seal the edges so the jam doesn't escape. My heart-shaped cutter is about 2 1/2 inches, and I used about half a teaspoon of jam in each. The jam should be quite thick and cold. Pastry and bread are my favorite, most satisfying things to make. How about you? 1 In glass measuring cup, stir together milk and vinegar; let stand a few minutes until needed. 2 In medium bowl, whisk together flour, salt and baking powder. Using a coarse shredder, shred butter into flour mixture. With fingers, quickly work the butter into the flour, leaving some pieces the size of small peas. 3 Gradually sprinkle the soured milk over the flour mixture while stirring with large fork. If dough is coming together with less liquid, don't use all of it. If more liquid is needed, add a little water a half teaspoon at a time. 4 Turn dough out onto a piece of plastic wrap and flatten slightly into an inch-thick disk; refrigerate for 1 hour. 5 If dough is thoroughly chilled, let it stand at room temperature for 10 to 15 minutes before rolling. On lightly floured surface, roll out dough to about 1/8-inch thick. 6 Using heart-shaped cutter, cut out hearts (My 2 1/2-inch cutter made 24). Using your finger, wet the edge of a heart with water. Spoon about 1/2 teaspoon of jam in center. Place another heart on top, press edges to seal and crimp with a fork. Repeat. 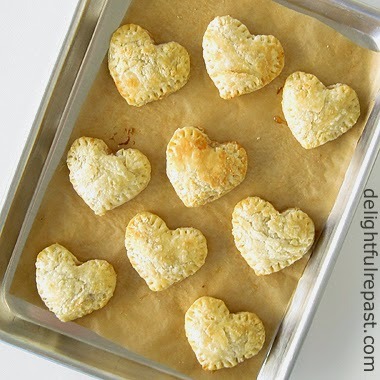 Place filled hearts on parchment-lined baking sheet and place in freezer while preheating oven. Note: If you need to re-roll scraps, use those hearts on the bottom. 7 Preheat oven to 400F/205C/Gas6. Bake pastries for 15 to 17 minutes, or until golden. Remove to wire rack to cool. I like a themed tea on occasion too. In a few weeks our little group will have "Tea and Crocuses". Natalie, thank you. And crocuses - - why do I always forget about crocuses? I love them. Enjoy this Saturday AND your upcoming tea. What a coincidence, as I just this morning invented the jam catheter for stealthy removal of same from heart pastries without leaving any trace of having stolen a heart-tart. BTW, that’s my suggestion for a name: heart-tart. Put me on the recipient list any time for a heart-tart donor. Okay, Sully, you're on the list! And I like 'heart-tart' -- short and sweet! BJ, thanks so much! I definitely have fun in the kitchen! Oh, I need to make these, they look soo good and perfect for this weekend! Saying hello from foodie Friday! Cathy, thank you! Nice to "meet" you! Your Heart Pastries are so beautiful and it was so lovely for you to share the recipe as I know everyone will love it! So glad you linked! What a lovely way to celebrate. Congratulations on 5 years. This post has made me realize, I don't own a heart-shaped cutter. I should probably rectify that! I wouldn't even begin to venture to make something as wonderful as these whatever-you-call'ems. I can just about manage a flapjack. You are very talented. And congratulations on your 5th anniversary! Bernideen, thank you. I just love grabbing a cup of tea and visiting your lovely tea blog. Thank you! Yes, Pauline, you *must* get a heart-shaped cutter! Jacqueline, thank you so much! I hope you and the GS like them as much as we do! Mike, thank you! And don't underestimate the wonderfulness of a well-made flapjack! Thanks, Angie! I like them because they're not too sweet with just that tiny drop of jam. Your heart tarts are perfect for Valentines Day or anytime that calls for a "sweet" occasion. They would be lovely to nibble on while sipping a cup of tea or coffee. Thanks for sharing your recipe and joining me for tea. Happy Valentines Day! Thank you, Sandi! And they'd look pretty on your transferware. Thanks, Amy! Wish I had a couple of them today! Thank you. A House with Hearts should definitely have a plate of heart-tarts! So perfect and lovely! I think I could eat way too many, Jean! Pom Pom, thanks so much! And that is precisely what *I* did! These are adorable! I think they'd be perfect anytime of year! Thanks for sharing these yummy treats with us at #FoodieFriDIY...I always love to see what you share! Michelle, thank YOU! Love #FoodieFriDIY! I love jam tarts but I've never had them heart shaped! These are lovely. Thank you, Maureen. My heart-shaped cookie cutter gets a lot of play in my kitchen for afternoon tea parties. Greg, thank you! That's exactly what I was hoping the second photo would show. Thanks, Gingi. But don't wait till then to try them! These do look delicious! I have made scones like this before with cherry filling in the middle! Thank you for sharing this recipe. Perfect for Valentines Day Afternoon Tea too! Thanks, Bernideen! I thought you might like these. Your scones sound wonderful!